It is recommended to say the following whispered prayer (mun¡j¡t) that has been narrated by Ibn Kh¡lawayh who commented on it, saying, “This is the confidential prayer of Imam `Al¢ Am¢r al-Mu'min¢n and the Holy Imams (a.s.) who used to recite it in the month of Shaban.” It is advisable to recite it with presence of heart all the time. and hoping for the reward that You have. and all my moves and stillness are known by You. and all the expectation that I hope for my future. including my secret and open matters, shall be experienced by me. and all my benefits and harms that come upon me. O my God, if You deprive me (of Your sustenance), then who else can ever provide me with sustenance? If You disappoint me, then who else can ever back me? O my God, I do seek Your protection against Your wrath and against the befalling of Your ire upon me. You are still expected to confer upon me with Your expansive favor. and You will decide for me that which befit You and You will include me with Your forgiveness. O my God, if you pardon me, then who else is worthier than You are in pardoning. I am then considering my confession of being guilty to be my means towards You. therefore, woe will betide me if You do not forgive. so, (please) do not stop Your favors from covering me after my death. while You have not shown me but the good throughout my lifetime? and confer upon me—a sinful person who is covered by his ignorance—with Your favors. but I need Your concealment more urgently in the Next Life. therefore, (please) do not expose me on the Resurrection Day before all the witnesses. and surely Your pardon is more preferable than my deeds. O my God, so (please) delight me when I meet You on the day when You shall judge between Your servants. so, (please) accept my excuse, O most Magnanimous of all those before whom the guilty make an apology. and do not disappoint my desire and expectation for You. O my God, had You wanted to humiliate me, You would not have guided me (to You). Had You decided to disclose me, You would not have saved me. O my God, I do not expect You to reject my request that I spent my whole lifetime asking for it from You. increasingly, and imperishably, as exactly as You like and please. and if You decide to send me to Hell, I shall declare to its inhabitants that I love You. then my hope for You is too big when compared to my prospect from You. while I expect, depending upon Your magnanimity, that You will endow me with safety and mercy? and I have spent my whole youth with the inebriety of being far away from You. and when I was taking the path that ends with Your ire. and begging You in the name of Your generosity. and I am hereby appealing for Your pardon since pardon is one feature of Your generosity. except after You aroused me to love You. Hence, I have become as exactly as You want me to be. and You have purified my heart from the filths of being inattentive to You. and whom You have conferred with Your aid and he thus has obeyed You. O He Who is too close to depart from one who is inadvertent to Him! O He Who is too magnanimous to deprive one who hopes for His reward! and a sight whose righteousness advances towards You. and he whom is attended by You shall never be boring. and he who resorts to You shall be succored. and do not divest me of Your kindness. the position of one who (incessantly) longs for more love for You. and (please) devote all my pursuit to my attaining the delight of the success that is achieved through Your names and the amount of Your Holiness. or those whom are deprived of Your pardon because of their inattentiveness to You. and that our souls hang to the majesty of Your Holiness. and You have thus taken into their confidence and they acted for You openly. and I have never lost hope in Your excellent magnanimity. then please pardon me for my excellent trust in You. then my belief in You has called my attention to the generosity of Your sympathy. then my recognition of the generosity of Your bounties has awakened me. then Your opulent reward has drawn me to Paradise. 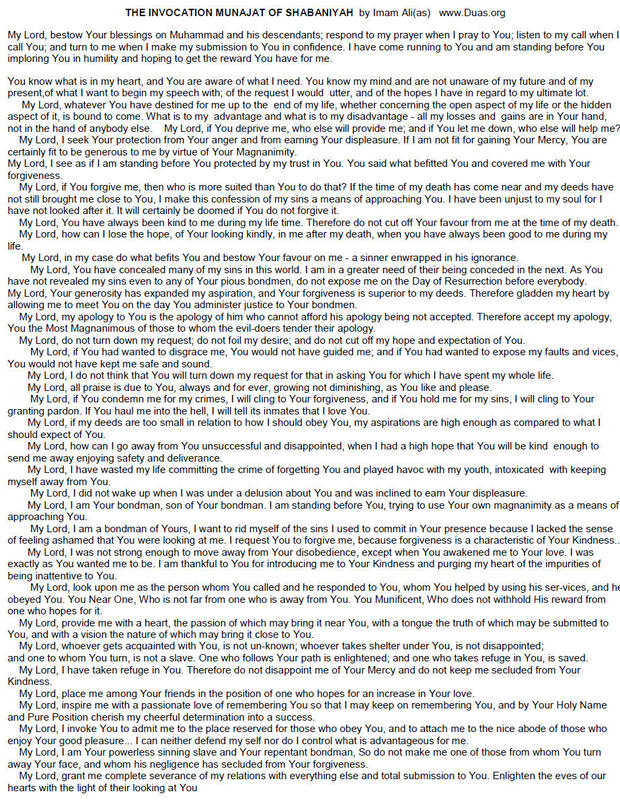 O my God, You alone do I pray and You alone do I implore and desire. and who never belittle Your affairs. and that I will be fearful of and careful with You. and exalt them very much. My Lord, bestow Your blessings on Muhammad and his descendants; respond to my prayer when I pray to You; listen to my call when I call You; and turn to me when I make my submission to You in confidence. I have come running to You and am standing before You imploring You in humility and hoping to get the reward You have for me. You know what is in my heart, and You are aware of what I need. You know my mind and are not unaware of my future and of my present, of what I want to begin my speech with; of the request I would utter, and of the hopes I have in regard to my ultimate lot. My Lord, whatever You have destined for me up to tbe end of my life, whether concerning the open aspect of my life or the hidden aspect of it, is bound to come. What is to my advantage and what is to my disadvantage - all my losses and gains are in Your hand, not in the hand of anybody else. My Lord, if You forgive me, then who is more suited than You to do that? If the time of my death has come near and my deeds have not still brought me close to You, I make this confession of my sins a means of approaching You. I have been unjust to my soul for I have not looked after it. It will certainly be doomed if You do not forgive it. My Lord, how can lose the hope of Your looking kindly, in me after my death, when you have always been good to me during my life. My Lord, my apology to You is the apology of him who cannot afford his apology being not accepted. Therefore accept my apology, You the Most Magnanimous of those to whom the evildoers tender their apology. My Lord, all praise is due to You, always and forever, growing not diminishing, as You like and please. a characteristic of Your Kindness. My Lord, look upon me as the person whom You called and he responded to You, whom You helped by using his ser-vices, and he obeyed You. You Near One, Who is not far from one who is away from You. You Munificent, Who does not withhold His reward from one who hopes for it. My Lord, whoever gets acquainted with You, is not un-known; whoever takes shelter under You, is not disappointed; and one to whom You turn, is not a slave. One who follows Your path is enlightened; and one who takes refuge in You, is saved. My Lord, I invoke You to admit me to the place reserved for those who obey You, and to attach me to the nice abode of those who enjoy Your good pleasure. . . I can neither defend myself nor do I control what is advantageous for me. My Lord, I am Your powerless sinning slave and Your repentant bondman. So do not make me one of those from whom You turn away Your face, and whom his negligence has secluded from Your forgiveness. My Lord, grant me complete severance of my relations with everything else and total submission to You. Enlighten the eyes of our hearts with the light of their looking at You to the extent that they penetrate the veils of light and reach the Source of Grandeur, and let our souls get suspended by the glory of Your sanctity. My Lord, make me one of those whom You call and they respond; when You look at and they are thunderstruck by Your majesty. You whisper to them secretly and they work for You openly. My Lord, I have not allowed my pessimistic despair to overcome my good opinion about You, nor did I ever lose my hope of Your benevolence. My Lord, if my errors have degraded me with You, You may forgive me in view of my unqualified reliance on You. My Lord, if my sins have made me unfit to receive Your tender affection, my firm belief has reminded me of Your Compassion. My Lord, if my disregard for preparations to meet You has put me to sleep, my knowledge of Your kind bounties has awakened me. My Lord, if Your severe punishment calls me to Hell, the abundance of Your reward invites me to Paradise. My Lord, I ask You and pray to You earnestly, I desire and request You to show Your favour to Muhammad and his descendants, make me one of those who always remember You and never violate the pledge they make to You, who do not fail to show You their gratitude and do not take Your orders lightly. allahumma salli 'alaa muhammadin wa aali muhammad. wasma' du'aa'i idhaa da'awtuk. wasma' nidaa'i idhaa naadaytuk. waqbil 'alayya idhaa naajaytuk. faqad harabtu ilayka wa waqaftu bayna yadayk. mustakeenan lak, mutadharri'an ilayk, raajiyan limaa ladayka thawaabi, wa ta'lamu maa fi nafsi, wa takhburu haajati, wa ta'rifu dhameeri, wa laa yakhfaa 'alayka amru munqalabi wa mathwai, wa maa ureedu an ubdi'a bihi min mantiqi, wa atafawwaha bihi min talibati, wa arjoohu li-'aaqibati. wa qad jarat maqaadeeruka 'alayya yaa sayyidi fimaa yakunu minni ilaa aakhiri 'umri min sareerati wa'alaaniyati, wa biyadika laa biyadi ghayrika ziyaadati wa naqsi, wa naf'i wa dharri. ilaahi in kunta ghayr musta'hilin lirahmati, fa anta ahlun an tajooda 'alayya bi-fadhli sa'atik. ilaahi, ka-anny binafsy waaqifatun bayna yadayk, waqad azhallahaa husnu tawakkuli 'alayk. faqulta maa anta ahluhu wa taghammadtani bi-'afwik. ilaahi, in 'afawta fa-man awlaa minka bi-dhaalik? wa in kaana qad danaa ajali wa lam yudneeni minka 'amali faqad ja'altu-l-iqraara bi-dh-dhanbi ilayka waseelati. ilaahi qad jurtu 'alaa nafsi fi-n-nazhari lahaa, falahaa-l-wailu in lam taghfir lahaa. ilaahi lam yazal birruka 'alaa ayyaami hayaati, falaa taqta' birraka 'anni fi mamaati. ilaahi, kayfa aayasu min husni nazharika li ba'da mamaati, wa anta lam toolini illa-l-jamkeela fi hayaati. ilaahi, tawalla min amri maa anta ahluhu, wa 'ud 'alayya bi-fadhlika 'alaa mudhnibin qad ghamarahu jahluhu. ilaahi qad satarta 'alayya dhunooban fi-d-dunyaa, wa ana ahwaju ilaa satrihaa 'alayya minka fil-ukhraa. ilaahi qad ahsanta ilayya ith lam tuzh-hirhaa li-ahadin min 'ibaadika-s-saaliheen, falaa tafdhahni yawm al-qiyaamati 'alaa ru'oos-il-ash-haad. ilaahi, jooduka basata amali, wa 'afwuka afdhalu min 'amali. ilaahi, fasurrani bi-liqaa'ika yawma taqdhi feehi bayna 'ibaadik. ilaahi, i'tidhaari ilayka i'tidhaaru man lam yastaghni 'an qabooli 'udhrihi, faqbal 'udhri yaa akrama man i'tadhara ilayhi-l-musee'oon. ilaahi, laa tarudda haajati, wa laa tukhayyib tama'i, wa laa taqta' minka rajaa'i wa amali. ilaahi, law aradta hawaani lam tahdini, wa law aradta fadheehati lam tu'aafini. ilaahi, ma azhunnuka tarudduni fi haajatin qad afnaytu 'umri fi talabihaa mink. ilaahi, fa-laka al-hamdu abadan daa'iman sarmadan, yazeedu wa laa yabeed, kamaa tuhibbu wa tardhaa. ilaahi, in akhadhtani bi-jurmi, akhadhtuka bi-'afwik, wa in akkhadhtani bi dhunoobi, akhadhtuka bi-maghfiratik, wa in adkkhaltani-n-naara a'lamtu ahlahaa anny uhibbuk. ilaahi lam yakun li hawlun fa-antaqila bihi 'an ma'siyatik, illa fi waqtin ayqazhtani li-mahabbatik. wa kamaa aradta an akoona kuntu fa-shakartuka bi-idkhaali fi karamik, wa li-tatheeri qalbi min awsaakhi-l-ghaflati 'ank. ilaahi, unzhur ilayya nazara man naadaytahu fa-ajaabak, wasta'maltahu bi-ma'oonatika fa-ataa'ak. ilaahi, walhiqni binoori 'izzika-l-abhaj, fa-akoona laka 'aarifan, wa 'an siwaaka munharifan, wa minka khaa'ifan muraaqiban. yaa dhaal-jalaali wal-ikraam. wa sallallahu 'alaa muhammadin wa rasoolihi wa aalihi-t-taahireen, wa salaama tasleeman katheeran. listen to my call when I call You; and turn to me when I make my submission to You in confidence. I have come running to You and am standing before You imploring You in humility and hoping to get the reward You have for me. My Lord, I am a bondman of Yours, I want to rid myself of the sins I used to commit in Your presence because I lacked the sense of feeling ashamed that You were looking at me. I request You to forgive me, because forgiveness is a characteristic of Your Kindness..
and one to whom You turn, is not a slave. One who follows Your path is enlightened; and one who takes refuge in You, is saved. My Lord, I invoke You to admit me to the place reserved for those who obey You, and to attach me to the nice abode of those who enjoy Your good pleasure... I can neither defend my self nor do I control what is advantageous for me.